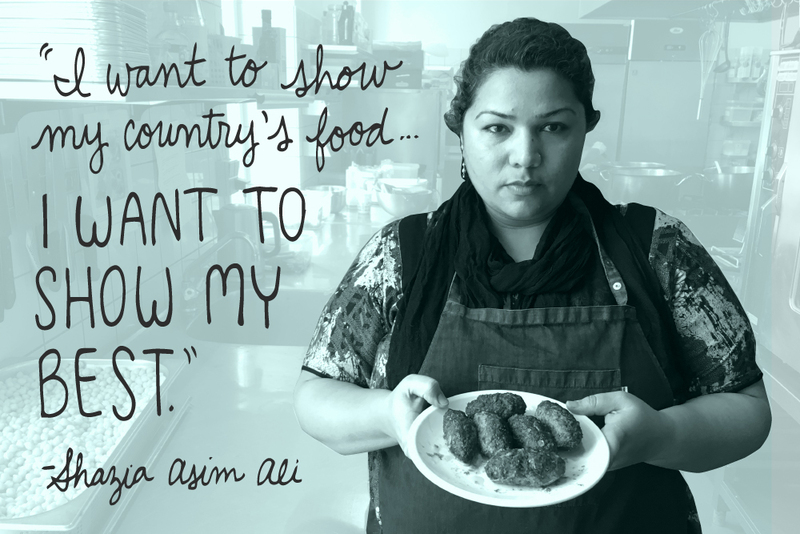 "I like to make food because I love to eat," replied Shazia Asim Ali when the Immigrant Women's Center in Copenhagen, Denmark asked her where she'd like to work, and if she, by chance, had any interest in making food. That response landed her at Send Flere Krydderier (Send More Spices) three years ago, where she has been working in the kitchen, three times a week, ever since. Send More Spices is an eatery where women from all different countries prepare food inspired by their traditional recipes. Housed inside the World Culture Center, they feed people who have come together for film festivals, musical celebrations, author dinners, debates, storytelling series, and "Tuesday Food Club," a long-table meal where mingling with your neighbors is highly encouraged (this way of eating is essential to surviving the long, dark Danish winters). In the Send More Spices kitchen, Ali shows off a plate of traditional food. "In Send More Spices, we know that it is not due to lack of motivation, but to the labor market requirements for language, education and work experience, which many women unfortunately cannot honor. With Send More Spices, we have created an alternative that wants to defy the statistics, and, instead of speaking about lack of competencies...recognizes women's cooking and cooking skills as the company's sustainable business base." With Send More Spices, we have created an alternative that wants to defy the statistics. Shazia experienced this challenge firsthand: "Because we come from other countries and want to find a job here, it's very difficult because we're not used to that in our own country." She herself comes from Pakistan, where women are typically not expected to work outside the home. It's also where she learned to cook from her mother. "I must tell you about my mother. When I was a teenager, I was in college. I was not interested in making food, but I was very interested in eating it...I love to eat Pakistan's food. After [college], I became engaged with my fiancé and my mother told me I had to learn how to make food. 'It's very important,' [she said], 'you have great education, you're beautiful and intelligent, but when you're married, food is very important for your husband, your husband's family, and your children. If you can make good food, you can give it to your family.'" Each woman brings a unique set of flavors to Send More Spices. Original artwork by Gina Lorubbio for GFJ Stories. 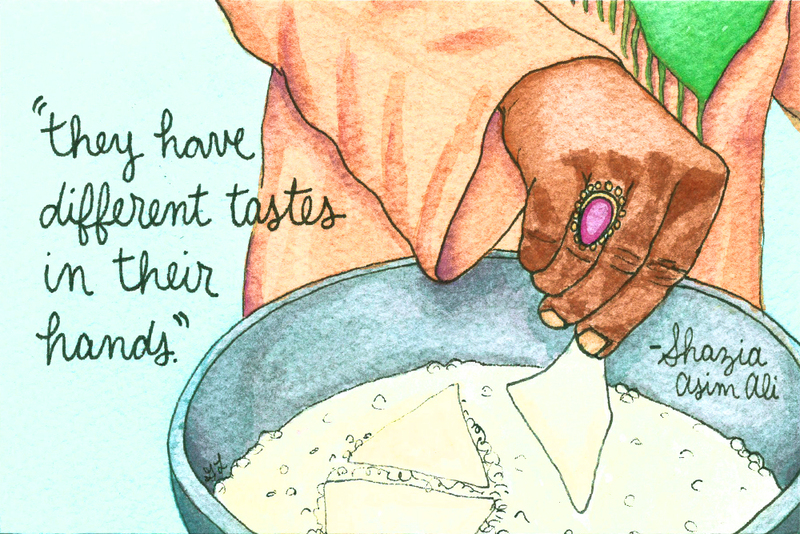 After her first cooking lesson, her mother told her how skilled she was - with her sharp memory, Shazia never forgets an ingredient. She says that it took about a decade to become really good. To this day when she's in the kitchen, she says, "I'm often thinking of my mother." Why is it called Send More Spices? Their website explains that the women "in the 1980s and 1990s always asked their family in their home country if they wanted to send more spices to Denmark. At that time there were no green grocers on each corner and when there were finally supplies from abroad, you had to queue for hours to get a small knot of ginger or a bundle of mint." When she's in the kitchen, she says, "I'm often thinking of my mother." Shazia's mother sends her recipes, which she workshops to make more delicious and ready to share with diners at Send More Spices. "It's my culture, my traditional food...I want to show my country's food. I want to show my best," she says proudly. "The other women, we've become very best friends. We're used to eating with each other... 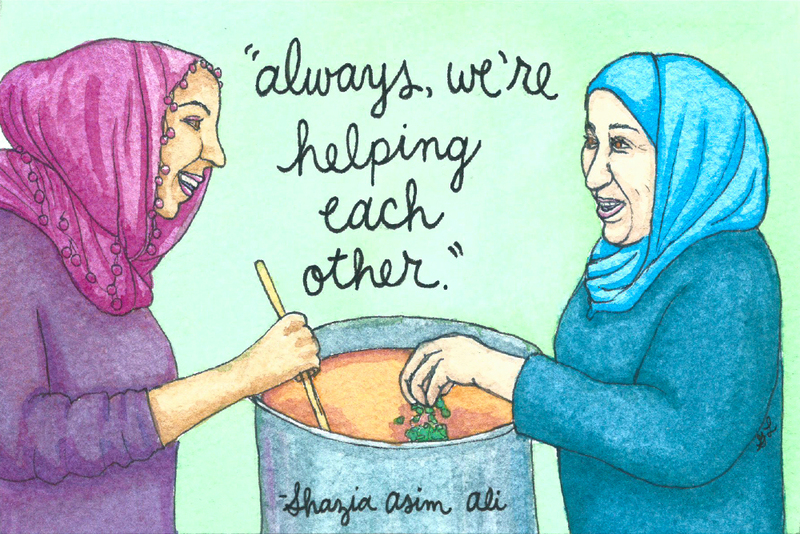 It's too good...Always, we're helping each other." I was in the throes of learning the language, navigating the new streets, and wondering if I'd ever feel like I belong. On the day that I came to visit, everyone greeted me with smiles. Shazia showed me the kitchen, buzzing with women of all ages. One of her colleagues, a woman from Cambodia, was stirring a pot of stew over a hot flame to serve at their "Tuesday Food Club." This atmosphere felt extremely potent to me, as I myself had moved to Denmark from the U.S. just six months earlier. I was in the throes of learning the language, navigating the new streets, and wondering if I'd ever feel like I belong. Seeing this group of women talk, laugh, and work together, and extend warmth to everyone who walked in, gave me hope that someday this new country might feel like home for me, too. The women pitch in to bring recipes from each other's home countries to life. Original artwork by Gina Lorubbio for GFJ Stories. "How do you say 'welcoming' in Danish?" I asked Shazia. "Venlig," she said. Friendly. This place exudes openness and friendliness. When you eat there, it's more than just a meal. On occasion, the meals they create are so special that diners rise up from their seats to give the women a standing ovation. In those moments, Shazia says, "we feel proud." In preparation for interviewing Shazia, I was nervous, and so was she. She was about to speak more English than usual and I planned to patch things up with my broken Danish whenever we stumbled. "We're growing today," I said as we were about to start. "Everyday! We grow so much every day," Shazia replied. 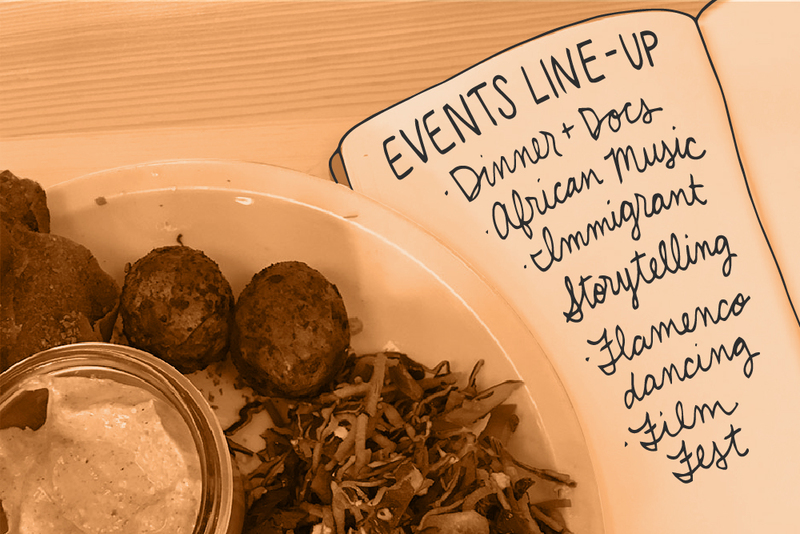 A sample of the types of events you'll find at The World Culture Center, where Send More Spices supplies the food. "I feel like it's my own country. My kids are here, they study here. My husband is here...I'm just used to talking with people, coming to work daily. I feel very happy because I have my own career here, my children have future, I have my home, I have respect in this social country as a woman... It's my country." Gina Lorubbio makes art about food and culture that puts wisdom and practical inspiration within reach. To buy her artwork, commission an illustrated recipe, join an educational cooking trip, or follow her current series on everyday home-cooking, visit www.americanheirloomproject.com.